Daily programmes of demonstrations and more – plus the official Cake International Prize Giving hosted by Rosie Cake Diva : Saturday at 1.15pm! 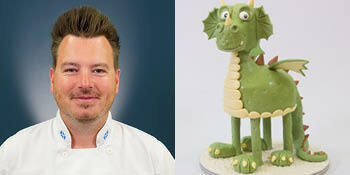 The face of CakeFlix, Paul has made cakes for the Queen, Prince Charles and Prince Albert of Monaco. He started his designer cakes business in 2002 and has made thousands of designer wedding and novelty cakes since and now his focus is on teaching his designs through the online School. With a lifelong passion for cakes, Paul is always thinking of the next design and enjoys nothing more than teaching the craft. Zoe Burmester from Sugar Street Studios shows you how to make this playful yogi llama cake. Learn how to carve a 3D cake without the need for structure and how to texture and sculpt sugarpaste to add personality to your character cakes. Zoe will also be talking about the importance of colour and how to embrace airbrushing to bring extra dimension and pop to your cake art! Known for her use of colour, Natalie will demonstrate colour and sugar flowers. Paul will bring this amazing 3D Dragon to life in just 45 minutes. His tag line of fast, fast, fast is certainly needed with this one! He will discuss the stand and his ganache techniques, before going on to cover the body, head, add legs then bringing it all to life! Graziella Augier of Design Sucre has always been fascinated with baking. Based in the South of France, Graziella’s love of nature and sugarcraft shows in her beautiful designs. 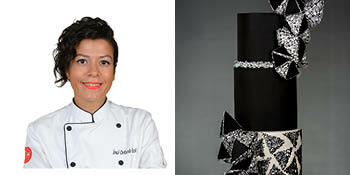 Graziella will demonstrate how to create these pieces using Isomalt. Cocoa butter paint is an amazing medium! Not only can you paint onto sugarpaste but directly onto chocolate ganache as well! Emily will show you her technique for covering a cake with dark chocolate ganache to prepare a perfect base to paint on. She will go through the basics of painting her signature flowers, composition and how to make your colours really vibrant against the dark background. Multi award-winning cake Rosie Cake Diva, stars in Channel 4’s Extreme Cake Makers. She has been featured in numerous magazines and was the winner of the Cake Masters Wedding Cake of the Year Award in 2012. She has since gone on to present the Cake Masters Magazine Awards at the star-studded event held at the NEC Birmingham for the past five years. Always wanted to learn how to paint with Buttercream?! The Cake Botanist invites you to learn how to use a palette of buttercream colours create a floral scene on a cake. Not only that with the help of Safety Seal, teach you how to decorate cakes with a wafer paper floral arrangement perfect for any occasion! Zoe Hopkinson is well known for her incredible modelling skills, watch Zoe model this cute Easter bunny and share her knowledge with you! Having baked from a young age, Fran decided to set up a cake business and trained with senior Squires Kitchen tutor and expert sugarcrafter Paddi Clark. Having developed her sugarcraft skills to a high standard, Fran set up a successful cake decorating business, Willoughby’s Handmade Cakes. Fran has worked with Squires Kitchen for several years, alongside running her own business and contributing to Cakes & Sugarcraft magazine. She specialises in creating feminine and elegant wedding cakes with clean, sharp designs and intricate sugar flowers, from David Austin roses to sugar succulents. Learn how to transform your cakes using fabulous acrylic stencils. Watch the demo to learn how to stencil for maximum impact! Claire will be demonstrating some super easy airbrushing & hand painting techniques to achieve amazing effects that will take your cakes to the next level. Domy will show you how to create Mini Girl using her high quality moulds. Domy will also show you how to create Mini Girl’s dress using her products. Valentina, an accomplished author and multi award-winning artist known for her attention to detail will show you how to freehand sculpt an elephant’s head using modelling chocolate. Molly has recently launched her own 3D moulds – Creature Creators – High quality moulds, designed by Molly, with a wide range of cute animals to choose from. Molly will demonstrate how easy it is to use her Creature Creators with this fabulous pug dog! See who takes home the Best in Show and Junior Best in Show trophies! Watch live on the Cake International Facebook page! Elza is respected by many of the top artists for her incredible sculpting skills. 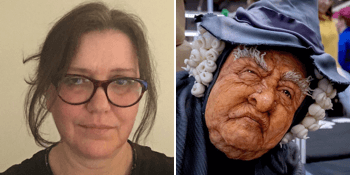 Watch Elza demonstrate one of her well known pieces, an old witch, and learn how Elza achieves these facial features. Learn how to create Edible Sugar Crystals, Edible Glitter and Three Dimensional Decorations.